Knotel, the fleixible workspace provider, has completed two new leasing transactions totaling 63,697 s/f in Midtown West. Knotel has completed approximately 625,000 s/f of leasing volume since the beginning of 2019. In addition to its rapid expansion in Manhattan and San Francisco, the company also recently expanded in Europe through a strategic acquisition of a majority stake in Paris-based Deskeo, the largest flexible office operator in France. • A 35,292 s/f lease at Vanbarton Group’s 45 West 45th Street. The new space encompasses the entire 3rd, 6th, 7th and 8th floors of the 16-story building, located between Fifth Avenue and Avenue of the Americas. Jared Horowitz and Ben Shapiro of Newmark Knight Frank represented Knotel, while Ethan Silverstein and Greg Kuhlman of Cushman & Wakefield represented building ownership. • A 28,405 s/f lease at Shorenstein’s 1407 Broadway. Knotel will occupy multiple office suites in the 43-story, 1.1 million square-foot building, which is situated just south of Times Square between West 38th and West 39th Streets. Bob Foreman of Shorenstein represented the landlord in-house in lease negotiations. There were no outside brokers for Knotel. 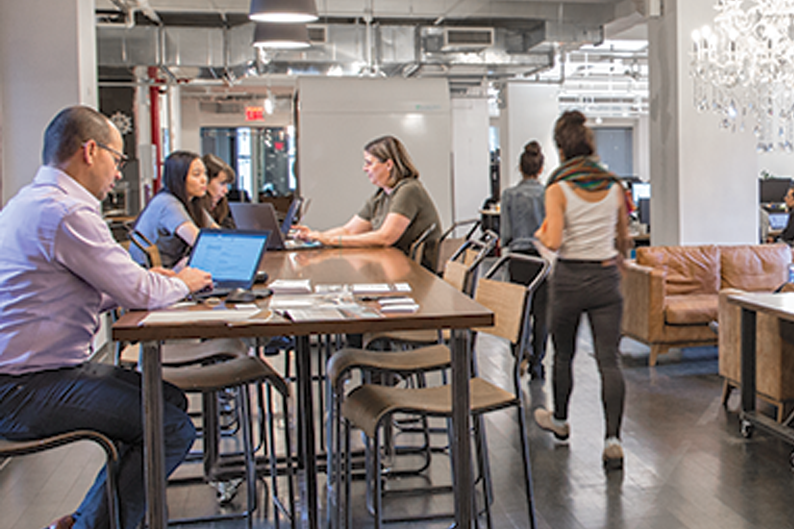 Knotel designs, builds and operates spaces for companies of 50 employees or more.